Stems: Ascending to erect, mostly simple, usually clustered, very leafy, densely soft-hairy. Leaves: Mostly alternate, simple, sessile, linear or upper often divided into 3 narrow lobes, 1-3 inches long, mostly less than 1/4 inch wide, crowded, soft-hairy; margins of lower leaves entire. Inflorescences: Spikes, to 8 inches long, 10-20-flowered, terminal. Flowers: Subtended by bracts, 1-2 inches long, 3-lobed, green, tips sometimes pinkish; calyces 1 to 1.5 inches long, bearing 5 linear lobes, greenish, soft-hairy; corollas 1.5 to 2.25 inches long, 2-lipped, upper lip arched, about twice as long as 3-lobed lower lip, pale yellow or creamy white to pinkish purple, projecting conspicuously beyond bracts; stamens 4, in 2 pairs. Fruits: Capsules, oblong-lanceolate, 1/2 to 3/4 inch long, woody, tips pointed; seeds numerous, small, angular. Habitat: Dry prairies and rocky hillsides. 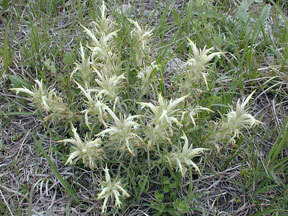 Comments: Downy paintbrush is partially parasitic on the roots of other plants, often members of the aster family.